Because I live in Canada, sweater-weather is approximately nine months out of the year. As a side effect, I’ve gotten pretty good at shopping for sweaters and knowing what fabrics are going to last. Here’s my rundown of the best places to pick up an affordable cozy knit this season, so you’re ready for anything. Let’s talk about fibres first. I love wool, cashmere, and even silk-blend sweaters because they have antimicrobial properties, keep their warmth even when wet, and just feel luxurious (I’m a sucker). There are still downsides though! They can shrink easily in the wash, they tend to be more expensive, and some people can be allergic. Acrylic is a popular synthetic alternative. These affordable sweaters keep their shape and are very resilient to wear-and-tear. Fleece is also making a big comeback this season, both natural and synthetic. All this to say, don’t be shy about going fishing for the composition tag while shopping. Uniqlo is a great store for basics and they do a great job of providing more luxurious fabrics too. Their selection of merino wool sweaters is vast in both styles and colours. They have merino, lambswool, cashmere, and synthetic sweaters. Not to mention their great selection of cozy fleeces. If you’re looking for a sportier option, Outdoor Voices has launched a new line of cold-weather wear that looks great for sports or every day. I’m particularly into their merino wrap sweater as well as their oversized bulky wool fleece. OV understand the perks of merino wool for sports but also make their styles very trendy too! Good old Everlane does basics so well and were one of the first to introduce a $100 cashmere sweater. They have wool, cashmere, and now alpaca sweaters in a rainbow of trendy colours and styles. You can count on them to have mostly classic styles with one trend-pushing option for the more adventurous types. They’ve also just launched a line of fleeces made entirely from recycled plastic! Washable Merino Wool has become a trendy item because it eliminates the common mishap of shrinking a beloved sweater. By mixing just the right combination of wool and synthetic fibres, washable wool is easier to care for. Frank + Oak make a ton of awesome styles for women from long-sleeve tops to oversized models. I tend to avoid fast-fashion when I can, but H&M Premium is just so good and affordable. The Premium line has silks, wools, cashmere, and linens in fashion-forward styles at great prices. Do be careful of their use of the word blend. They will list the percentage of each in the item description though, so you can investigate. An honourable mention goes to places like Marshalls, TJ Maxx, and Winners, that don’t have online shopping but have huge amounts of high-quality sweaters at great prices. As fun as it is to shop for new things, many of my favourites sweaters are second-hand! Good quality lasts and thrift stores are a great place to scout out a unique sweater. If it needs a little love, just pick up a sweater pill-shaver and you may be surprised how fresh it looks. 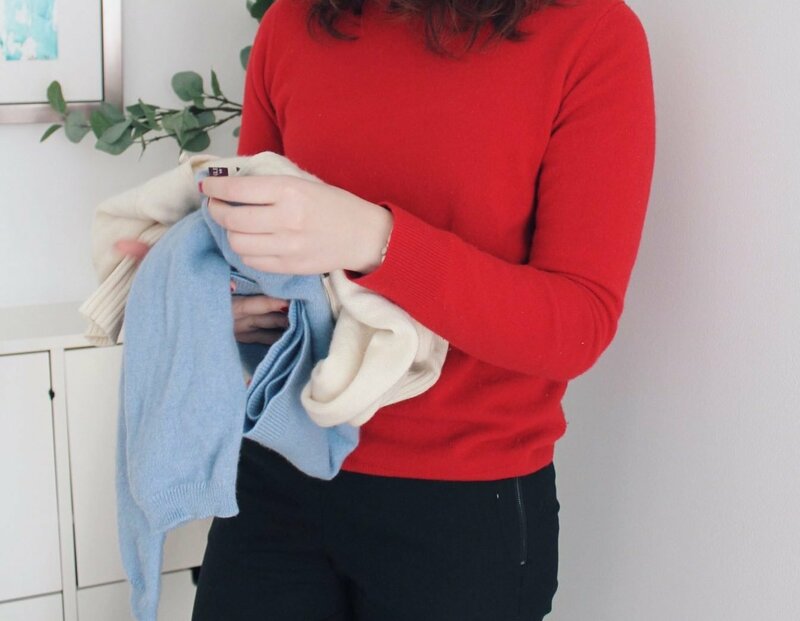 To extend the life of your sweaters, be sure to follow practical laundry tips like these ones on how to store, wash, and mend your knits. Thanks for these great suggestions Andrea! Do you know if Uniqlo Canada offers online shopping? I believe they do, but you need to use their app to order online since their Canadian website doesn’t have eCommerce yet. It may be easier to wait until your next visit to Toronto or Vancouver, sigh.